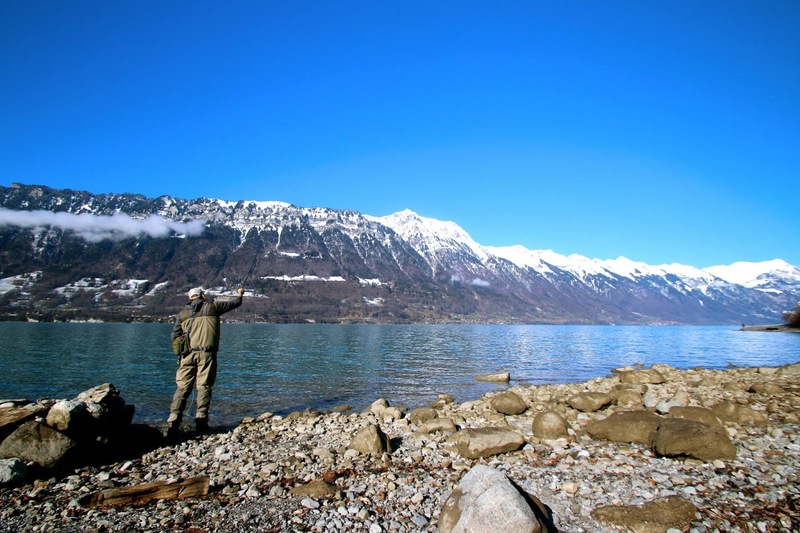 My colleague and I recently set up a small outfit here in Switzerland catering to the fly fishing needs of expats (www.firebelly.ch, if you're curious) and we've got a few events for local flyfishers coming up throughout the year. The first of these events took place last weekend, and we set it up along with Sascha Urweider, a Swiss chef and flyfisherman. He also happens to be a phenomenal underwater photographer and videographer, evident on his popular Facebook page, Fishing Swiss Alps. The season on lake run brown trout starts in February, and we couldn't wait to get something together despite the admittedly slim chances at success. Making sure to be very transparent as to the unlikelihood of actually catching a lake run brown from the shore on the fly, we called the event "1001 Casts" and went about setting up an evening of fly tying, beer, Sascha's delicious burgers, and some fishing the next morning. We arrived at his hotel in Innertkirchen a bit early to take care of some business, and around 6pm, the first attendees started showing up. I was particularly happy to finally meet some people that I'd interacted with for a while now on the internet, and it was nice to see a healthy mix of english speakers as well as natives. After the introductions, we sat down and enjoyed gourmet burgers and fries before breaking out the vises and starting to tie. I didn't do too much, I was sandwiched between two great tiers and was busier watching them and talking. The feathers flew and the empty beer glasses multiplied throughout the evening, and we hit the sack at around midnight, some people stayed up hours later... Mark and I are both fathers of young kids so waking up the next day at a normally unimaginable 7:30am was relatively luxurious. We had a leisurely breakfast of fresh bread, meat, cheese and the traditional Swiss Birchermuesli. The morning started out overcast, but the fog burned off in time for lunch, revealing the alps and the deep turquoise blue of the Brienzersee. 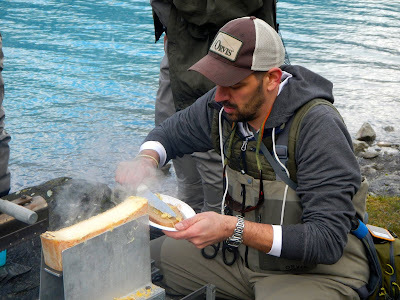 No one had any success with the fly rod, and we consoled ourselves with a delicious and unique shoreside lunch of Raclette, some people fished for a few more hours , tried out different rods and lines, and gradually made their way back home. Raclette, for those that don't know, is basically melted cheese on bread or potatoes. All in all a very enjoyable time, it just goes to show that flyfishing is just as much about being outside and among old and new friends as it is about catching fish. We'll do it again next year with the expectation to get skunked, but we'll surely be having a good time doing it. 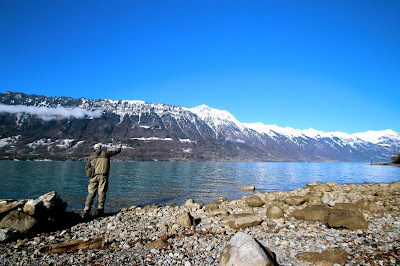 The only thing that could have made it better were some fish, but the chance to meet, tie, and fish with such a big and friendly group of the most passionate flyfishermen and women in Switzerland was fantastic. We'll definitely be planning something similar for 2017, hope to see you there! I know I'm not alone in having a healthy appreciation for the history of fly fishing, so when I found myself in London on a recent business trip and the opportunity presented itself to fish the famed Orvis beat on the River Itchen, I didn't need much persuading to bring along my waders and gear. After checking out the Orvis UK headquarters and warehouse, I headed out to the beat with Richard Banbury. The English countryside around Winchester was absolutely beautiful with pheasants and thatched roofed houses around every bend, and as we drove Richard told me about all about the region. In short order we arrived at the beat and geared up in the fishing hut. The Abbots Worthy beat of the Itchen is stunningly beautiful short stretch of chalk stream water and to see a river like this so close to London was quite a surprise. Gin clear water with big wild fish nestled between patches of flowing watercress, a classic little fishing hut, manicured banks and narrow little footbridges combine to make a dream fishery and it's no wonder that Jimmy Carter and George Bush Sr. both came here to wet a line. On our way to the beat in less than optimal weather. George, barreling over a footbridge. A nice brown that succumbed to a dry. The weather was unfortunately less than perfect, but my habit of overpacking served me well as my waders and wading jacket kept me plenty warm in the howling wind and driving rain. Casting wasn't particularly easy on a day like this, but I was in fly fishing heaven for the few hours that I was there. I sight fished some grayling with a nymph and caught a few browns on a dry, enjoying the company of Richard and his fine black lab, George. Richard took a few fantastic photos for which I was very grateful. 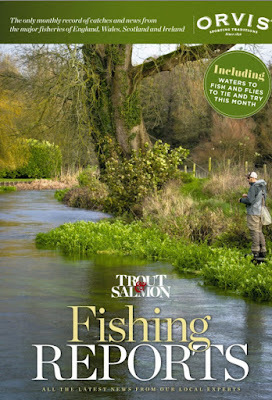 One even landed in Trout & Salmon Magazine, much to my surprise and yes, delight. A beautiful photo by Richard Banbury. I admit it, I bought multiple issues. My 10 foot 4 weight Recon was the perfect size for this fishery and handled the wind admirably, but I have to be honest: If the opportunity ever presents itself again, I'm bringing a bamboo rod and a classic old clock and pawl reel. I don't think there would be a better way to pay respect to such a beautiful and storied river.